Everybody know that the big money's in pain rays and various other wargadgets, so we really like it when someone at least tries to do a little good in the world. 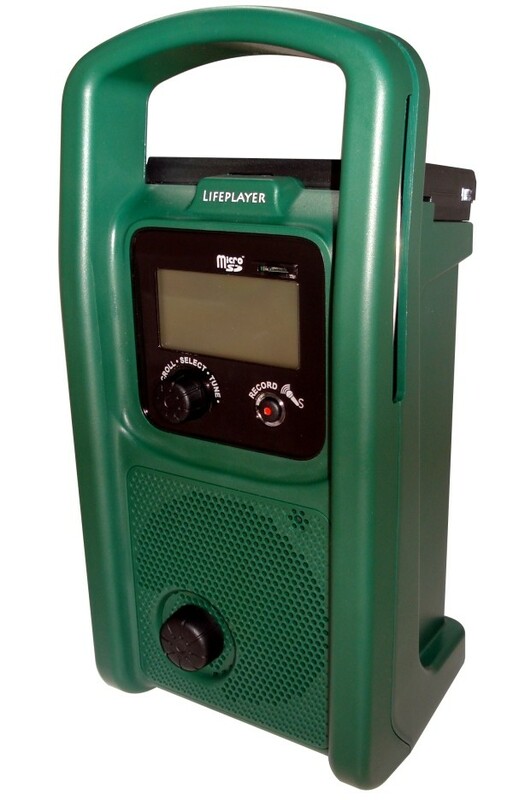 Lifeline Energy is a UK-based NGO that works to bring folks in emerging markets (mostly sub-Saharan Africa) items like solar-powered radios and lights, and it has just announced the launch of the Lifeplayer self-powered MP3 player and AM/FM/SW radio. This device features 64GB storage, microSD card slot, 3G connectivity, audio recording capabilities, and the ability to act as a sort of PA system -- according to the organization, groups of sixty can hear the thing clearly. It's powered either by a hand-crank or through its solar panel, and contains a USB port for charging devices such as cell phones. At present, Lifeline Energy is distributing over a thousand of these bad boys in Haiti and it's accepting donations to distribute them in Pakistan as well. Hit the source link to see how you can help. PR after the break. Update: Turns out that blue radio we originally pictured isn't actually the Lifeplayer -- that was the Lifeline radio, which predated it by roughly seven years. The green device above is the real deal, and you'll find a high-res product image of it right after the break. London, 16 Sept. 2010 -- Lifeline Energy (www.lifelineenergy.org) has launched a revolutionary, solar and self-powered digital MP3-enabled radio called the Lifeplayer. The Lifeplayer bridges Internet, cellular, media player and radio technologies and can deliver on-demand educational programming for the poor. The non-profit, formerly known as the Freeplay Foundation, designed and engineered the product in South Africa after years of research undertaken in sub-Saharan Africa. The Lifeplayer represents the first time that the extremely poor have the opportunity to access real-time information on demand anytime, anywhere – in even the most remote locations -- without concern for electricity or batteries. The device serves as an ideal medium for instructing groups in English, math, science, financial literacy, business training and other subjects where there is a shortage of skilled teachers. It also will be used to teach government and private sector workers, as adult education is almost non-existent in developing countries. "We aimed to create a game-changing innovation that could bring together communications to allow different media to work together in combination," said Lifeline Energy Chief Executive Officer Kristine Pearson. "Our mission is to provide practical solutions to unmet needs surrounding energy poverty. With access to modern information sources and clean energy light, people can dramatically change their daily lives to engage in small business and educational opportunities that can lift communities out of abject poverty." SC Johnson will be the first organisation to use the Lifeplayer, in an educational outreach program for pyrethrum farmers in Rwanda. As a major purchaser of pyrethrum, a plant-based pesticide, SC Johnson sees this as an opportunity to provide Rwandan farming communities with increased access to agronomic "best practices," market information and health news – which will ultimately support economic growth and increased quality of life in the region. Other solar-powered and wind-up products that Lifeline Energy uses in its work include the Prime radio and the Lifelight. The new Prime is an upgrade to the Lifeline radio, awarded Silicon Valley's first Tech Award for Technology Benefiting Humanity, which has reached more than 10 million people in Africa since 2003. 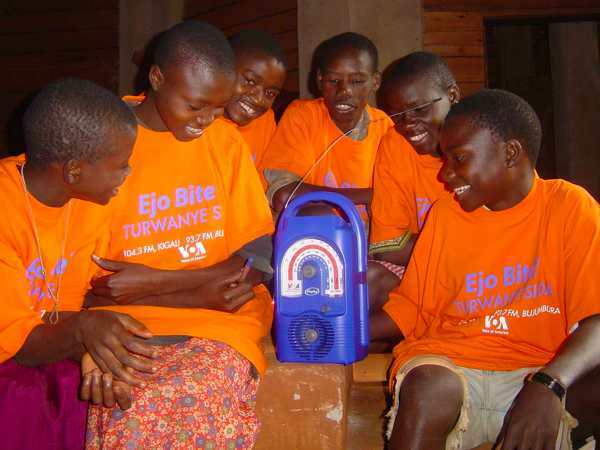 The Lifelight, launched in 2009 to significantly reduce dependency on dangerous kerosene and candles, enables people to benefit from clean, bright LED lighting to improve the quality of life after dark. Two-time Academy Award winner Tom Hanks, Lifeline Energy's American Ambassador, recognises the powerful impact that renewable energy solutions can bring to the poor and is the primary funder of our Lifeplayer and the Lifelight. Mr. Hanks said, "Here's a vision of lives being improved through simple, yet ingenious technology: a teacher uses the Lifeplayer's MP3 function to pause, re-wind and replay a lesson until it is clearly understood by all students. Later that day, local elders use the same Lifeplayer to record in their own voices a chapter of their village's oral history. Then the lesson and the elders' oral traditions are downloaded and broadcast on the community radio station. That is the goal of Lifeline Energy's mission: to get energy technologies into the hands of those who need them, who will use them in creative ways that we can't even imagine." Other film industry leaders support the Lifeplayer as a clean energy tool that will boost education access to a new level in rural Africa. Joining Tom Hanks in supporting Lifeline Energy's design and engineering efforts are Tim Allen, George Clooney, producer Laurie David, Fox Filmed Entertainment Chairman and CEO Jim Gianopulos, Creative Artists Agency President Richard Lovett, and Universal Studios President and COO Ron Meyer. The Lifeplayer, created for humanitarian sector use only, can be pre-loaded to hold years of educational content – up to 64GB; can update programming with an microSD™ card, including downloaded audio Internet content; can play downloaded cellular content sent across 3G networks; and can record live voice onto the device that can later be uploaded to the Internet. The Lifeplayer is robustly constructed to operate in any climate and condition, and with its robust sound system, groups of 60 listeners can hear it clearly. Powered by solar or a hand-crank as a secondary energy source, the Lifeplayer is completely power independent, which is critical given the paucity of electricity in rural areas. Its wireless solar panel can charge a cell phone through a USB lead, an essential feature since people often walk miles to charge their phones. "Lifeline Energy has worked in Rwanda for more than ten years while known as Freeplay Foundation, and we embrace their forward-thinking efforts to address the energy needs of rural Africans," said the Honourable James Kimonyo, Republic of Rwanda's Ambassador to the United States. "A tool of this nature could be instrumental in disseminating quality educational programming to citizens across Africa." "The Lifeplayer bridges Internet, cellular & radio technologies at an unprecedented level," said Pearson. "I think of the Lifeplayer as the iPod® for development. But unlike an iPod®, the Lifeplayer serves groups and communities and costs just cents per person over a year." Pearson said the product is not limited only to school-based curricula. "Imagine loading a programme on how to start a business, understanding micro-finance, agricultural best practices, environment and climate changes, health promotion and disease mitigation, health worker and teacher training, all in local languages," she said. "The Lifeplayer democratizes education. You don't have to be literate, feel intimidated by the technology or worry about batteries dying. It is a reliable, user-friendly tool that inspires people to learn at their own pace, to think and act differently, to pursue passions and different interests. It will help people to make and more informed choices and decisions. To enhance literacy levels, it can even hold dictionaries and be a 'talking book'." As Mrs. Kamba, a rural Liberian woman said, "The women in Liberia have been going way backwards for too long. We need these modern things to bring ourselves forward. This device [the Lifeplayer] can only help us contribute to society." The Lifeplayer has outstanding sound quality to ensure 60 learners can hear it clearly. There are AM/FM/SW bands allowing for local and international radio access. Radio remains unrivalled as a communication medium, but has limitations. If you're not listening at the time of broadcast, you never get a chance to hear a lost programme. With the MP3 Lifeplayer, people can record live programmes and repeatedly listen to them 24/7 and in an emergency or disaster, educational or informational programming for displaced populations can be locally loaded. Pearson commented about the organisation's broadening product offerings. "It took several years before we thought through the fact that hundreds of thousands of people were listening in the dark to their Lifeline radios. That inspired the development of the Lifelight. Now we have the Lifeplayer, which will enable Lifeline Energy to deliver a product, and the educational programming that under-resourced communities desperately need, to millions across Africa. We also can produce or source content as needed on any subject." Lifeline Energy will procure Lifeplayers through its new product development and trading arm, Lifeline Technologies Trading, Ltd. (LTTL), which carries out product development in response to the needs of end users and conducts sales for the aid sector. LTTL manufactures, markets and sells products to NGOs, multilateral and bilateral agencies, government ministries and others in the humanitarian sector, donating its profits to support the work of Lifeline Energy. Demand within the aid sector has been overwhelming since the Freeplay Foundation launched the Lifeline radio in 2003. More than 215,000 have been distributed across Africa and elsewhere, reaching anywhere from 20 to 250 listeners per radio. Currently, more than 1,000 Lifeline radios are being distributed in Haiti and Lifeline Energy is accepting donations to assist Pakistan's flood victims with information and light. Working in more than a dozen countries, primarily in Africa, Lifeline Energy focuses on reducing energy poverty for the poorest, with an emphasis on women and girls. Partnering with local aid organisations, Lifeline Energy assesses the target population's energy and information needs, co-creates appropriate distribution strategies and trains end-users to maximise the benefits of Lifeline products. It fully engages the community, working with vulnerable groups to design renewable products they need in their day-to-day lives, which also can be used in microenterprises. Lifeline Energy remains a registered 501 (c)(3) tax-exempt charity in the USA, a registered charity in the UK and is a Section 18A and 21 non-profit in South Africa. Under its new name, Lifeline Energy retains all board members in the USA, UK, and South Africa, as well as its ambassadors: Tom Hanks in America, Mount Everest and South Pole trekker Sibusisu Vilane in Africa, and noted humanitarian Terry Waite in Europe.